Storm Team4 has the forecast for July 12, 2017. 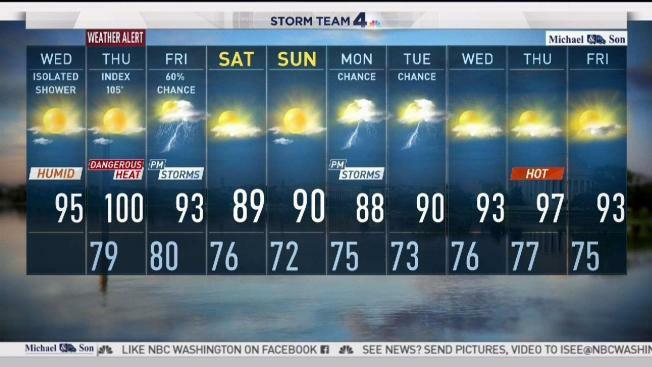 Blazing heat and humidity is returning to the D.C. area, as temperatures soar into the upper 90s. The heat index will near 100 degrees Wednesday, but Thursday will be even hotter, Storm Team4 meteorologist Sheena Parveen says. The heat index is expected to reach 105 degrees in some areas Thursday. There could be an isolated afternoon thunderstorm on any of those days, with rain chances hovering around 30 percent each day. The highest chance for rain will be Friday. But there is some good news: The temperature is expected to drop slightly Friday, and fall into the 80s over the weekend. The heat index will near 100 degrees Wednesday, but Thursday will be even hotter, Storm Team4 meteorologist Sheena Parveen says. The heat index is expected to reach 105 degrees in some areas Thursday. 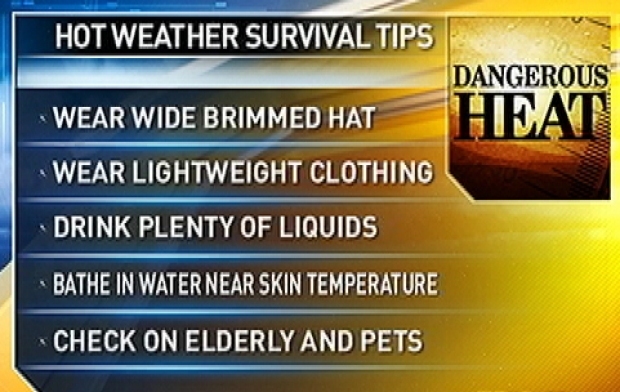 Here are some ways you can keep cool. If the heat index rises to dangerous levels, multiple cooling centers will be available to the public in the D.C. area.